All transactions are safe and secure with a reliable history in online purchasing behind each of our associates. Buy the Paulie Bleeker Costume to own Juno clothing and merchandise. 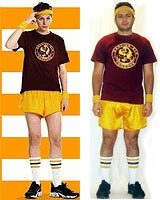 This Juno Paulie Bleeker costume is the perfect outfit to wear for a quick run or a happening costume party. The officially licensed ensemble includes the tee, gym shorts, two terrycloth wristbands, a terrycloth headband and striped gym socks. Make Bleeker proud with this fun Juno costume. Just make sure that you don't make a doodle that can't be undid. After all, girls will likely be swooning over the gold gym shorts and matching party socks. They worked for Paulie in the Juno movie. In addition to the Paulie Bleeker Costume above, browse the Juno Clothing Gallery for more apparel like men's and women's clothes, kids shirts or hoodies.